– Prayer must be at the center of all we do. We can’t possibly think our good ideas and hard work alone will drive any missionary work. God and only God must be the driving force behind all we do. He delivers the good ideas we have and the successful work we perform. We must stop what we’re doing to pray. Forfeit prayer and you forfeit grace, forfeit grace and you forfeit success. Prayer should take place before, during and after any works of the Lord since grace is our fuel, and we need God for everything. – You can talk to people till your blue in the face to try and convince them of any number of good things, but the lost won’t understand you if they are without the grace to comprehend. Grace is real and the lost don’t have it. Many people don’t want to go to church, or confession, even when the greatest of reasons are carefully explained to them. They continue to do evil—which is so obvious to us—yet they think they aren’t doing anything wrong, from their false justifications they make from their lack of knowing right from wrong, or from fear which stems from a lack of grace due to sin. The faithful have been diligently trying to end abortion and other moral atrocities by giving great sound arguments of reason and logic to the spiritually deaf and blind, in hopes to create laws to protect the innocent. Unfortunately people without the grace to understand simply won’t understand, and there will be no change. We can’t take grace for granted, and we need to fully understand the gifts God bestows on us and how blessed we are to possess them. We must take great pity on those who don’t have these graces and pray and sacrifice for their conversions. People who are dead in their sin or very weak in their relationship with God, can’t understand reason or logic because their logic is all goofed up from of a lack of grace which makes someone blind and dumb. We must convert the people first before change can happen. We should go back up to square one. Square one starts with prayer. 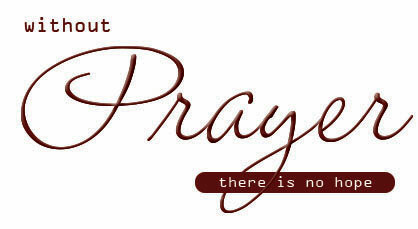 With out prayer–God–nothing can change. Prayer delivers the grace the people need. How can anyone know right from wrong, if they don’t know God? So why are we spending all of our time trying to educate them about injustices, when no matter what we say, they still won’t understand. Our time would be much better spent encouraging them to pray while we pray and sacrifice for them. Still educate since there are always some who will have ears to hear, but for the vast majority our efforts should be shifted to encouraging prayer. Flood the world with the promised joys and peace that comes from prayer, and it will bring on the complete revolution we need. God is so much stronger than any clever words or arguments we can come up with. God’s power, through prayer, is what truly transforms people. He is faithful and will deliver the help everyone needs. Fully believe in the power of prayer. After the people begin to pray they will obtain a certain amount of grace which will allow their hearing and comprehension to improve. Someone only knows God, as well as right from wrong, by talking to Him through prayer. If there’s no prayer, there’s no change; no change, no knowledge; no knowledge, no wisdom. Everyone wants to do the right thing—even people who are blind to the truth who seem to do so much wrong and hurt so many). They are simply living in darkness, which is why they cannot see right from wrong. To them the right things are power, control, success, popularity, etc. Work hard on getting people to pray, then change will happen. Visit www.The3oclockChallenge.com for great ideas on how to encourage everyone to pray. – Another way to obtain the grace people so desperately need in order for them to understand moral logic and reason—and to understand their faith so that they’ll desire to reconcile with God—is to pray for the people. God not only sends grace to people when they pray, but God also sends grace when we pray for others. If we gather the priests and the holy people of the Church together to pray for all the people in their community on a daily basis—both during and after the Mass—then God will deliver additional graces that will motivate them to make the right choices, and bless them with the ability to hear the truth when it is spoken to them. “Lord, envelop the people, especially those who have left the church, with a passion to know, live, and serve You above all.” Encourage your pastor to make praying for the lost souls a daily prayer request. – The blood of Jesus is the most powerful tool we have to soften hardened hearts and convert souls. In order to access the abundance of healing power which comes from Jesus’ blood we must be willing to suffer. One way is to intentionally choose the cross by denying ourselves of worldly pleasures. Another is when God allows a cross to befall us—as in any type of illness or suffering—and we neither complain nor desire to rid ourselves of it, but willingly suffer like Christ suffered. In doing so, we put our complete trust in God’s great plan, offering up our pain for the salvation of souls, carrying our cross as long as Our Lord sees fit and asking only for God’s will to be done (whether that means removal of the cross or continued suffering). It is through this willingness to suffer, like Jesus did, that most hardened hearts are softened, and huge conversions take place. Click here to learn how to suffer like Christ. – Since the majority of people don’t pray, this is also the reason why most don’t go to confession, participate in the Mass, go to church activities, or even attend church at all. Most people like the thought of prayer, but when they don’t see immediate results, they quit. Teaching people to persevere and trust in Our Lord is an invaluable lesson. If you initially try to teach complicated prayers—such as the Rosary or the Divine Mercy—to people who don’t generally pray at all, the long prayers will seem daunting to them, it all becomes too much of a challenge for them, and they quickly abandon the prayer altogether. – EVERYONE—especially the faithful—should be giving some sort of devotion to Our Lord at the hour he died. 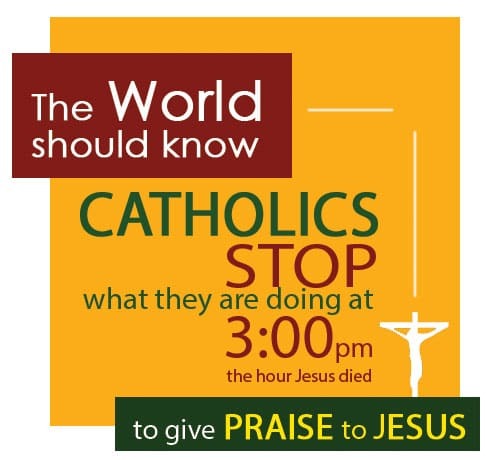 The world should come to know that Catholics stop what they’re doing at three in the afternoon, and give praise to Jesus—even if it’s only for a few seconds. We need to set an alarm to make this a priority. Through a private revelation to Saint Faustina, Jesus asked us for prayers at the three o’clock hour, and we should obey Him. We can be a witness of our faith to others, while giving God the adoration He deserves. www.The3oclockChallenge.com has developed an easy way to inspire the masses to pray. They encourage the people to start praying daily, for just thirty seconds at 3:00pm (the holy hour). EVERYONE CAN DO THAT. They offer a free downloadable prayer app that sounds an alarm daily at 3:00pm, it also gives people optional thirty second prayers they can pray while venerating the Divine Mercy image of Jesus. This is the beginning of everything. Without prayer—where grace is delivered—there is no hope of getting people back into the confessionals. – The people in the church, and in the community, need to make dedicated time in their day to pray. Making the 3 O’clock Challenge a fun challenge for everyone to partake in daily, and constantly striving to encourage it, will transform lives. Once people start to pray, God’s grace will build up in their souls, and then the blinders will fall off their eyes so they will be able to see and hear the truth. They will become involved in church and begin to pray other prayers as well. It is then that change will happen. – When we go out into the world and proclaim the Gospel (visit with people in the community), we need to be careful what is said to the spiritually blind and deaf. Why argue over beliefs—what good will come of that? A person who wants to fight isn’t open to change. We don’t need to prove we are right; lets deflate our ego a bit –that sin of pride can consume us and destroy any good God wishes to do through us. However, we can find a united ground by stepping away from arguable topics and simply encouraging others to pray and develop a relationship with God, by praying for thirty seconds a day at the hour of His death. People want to pray—and they can do this. So few people know that Jesus died at 3:00pm. 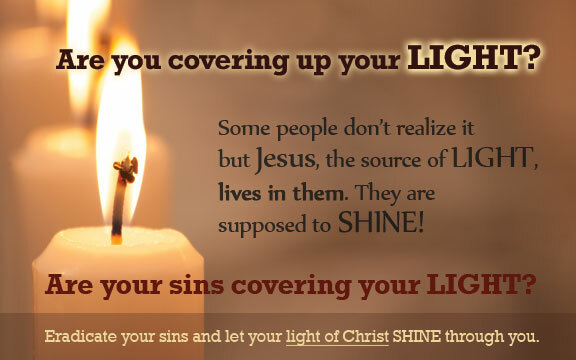 The 3 O’clock Challenge suggests we visit people door-to-door, not to offer preaching but simply to give them a Divine Mercy image of Jesus, tell them that Jesus died at 3:00pm—awareness of the holy hour alone can change lives—and encourage them to set an alarm on their phone with the free prayer app, or some other alarm, to remind them to give praise to God at His great hour of mercy. – First, visit your community, and encourage the people to pray for just thirty seconds at 3:00pm, giving out the Divine Mercy image—along with your Mass and reconciliation schedule, and a 3 O’clock Challenge sticker. Revisit them later with more encouragement for those who’ve forgotten to pray, by giving them a 3 O’clock Challenge reminder—a magnet or something—showing your love for them. Then visit a third time, with a flyer reminding them of your parish’s Mass and confession schedule. Don’t worry about being a nuisance–unless they say you are. God never stops knocking at our door, and we shouldn’t give up on the people who are lost either. Of course use moderation and good judgment and if someone doesn’t want you to come and visit, don’t go. You won’t convert anyone who is closed to your loving gestures by bothering them. You must pray and sacrifice for their souls. They will convert if you are diligent and faithful in your prayers. Continue going out to the people until they come back to the Church. Most people do need constant reminders to continue praying, even for thirty seconds, that’s why having an alarm set is so important. Even though sometimes an alarm can be fallible, or people might turn it off, it’s still a reminder as to the importance of prayer. Therefore, visiting with a reminder—giving them some sort of 3 O’clock Challenge material—will give them the encouragement they need to pray in order for them to obtain grace for a life of joy. 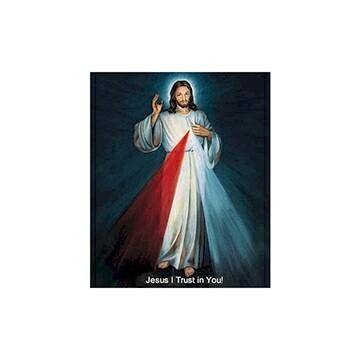 Finally, since they have the Divine Mercy image now in their home—many people have experienced God’s grace from that image alone—they may be more driven to go to a parish that provides information with that image on it. The 3 O’clock Challenge provides an easy to use template that you can use to put your parish’s information on it for distribution. Everything is available for you to easily bring the new evangelization to the people and bring them back to the Church. Sacrifice yourselves for sinners, and say many times, especially when you make some sacrifice: O Jesus, it is for love of You, for the conversion of sinners, and in reparation for the sins committed against the Immaculate Heart of Mary. – Most people consider ‘snail mail” to be a thing of the past, but because of that it’s even more effective now than email is in getting people’s attention. With bulk mail you can send out a very large postcard with the Divine Mercy image of Jesus on it, with information about praying at 3:00pm on the back. Most people actually keep the beautiful image of Jesus and might even pray on their own without any encouragement. However, this is a less effective method of bringing love to Christ’s people, but if you can’t find parishioners willing to start a missionary group to go out into the community—or you need to canvas a large community—this can be a productive method and it can also be used in conjunction with any missionary group. 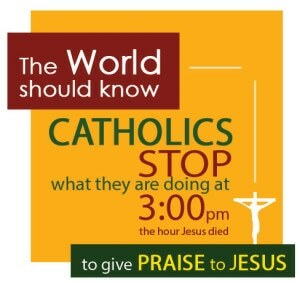 www.The3oclockChallenge.com offers postcards you can customize for your evangelization needs. You can even send little reminders of God’s love, mercy and forgiveness through the mail as a complimentary follow-up to your visit. God will use all of your efforts to evangelize the people. We simply need to do them and pray and say, “Yes, Lord” as He works through us to save the souls of His children. – Some people have ears that can hear. They have simply been waiting for someone to tell them about the need for prayer and confession. They aren’t so blind that they can’t see the need to hear God’s word and make a change, so while you’re encouraging them to pray for thirty seconds each day at 3:00pm, you can also teach them about the need to go to reconciliation as well as all the graces that come from the sacrament. Then, those who can hear can become united with Christ once again—if they are in a state of mortal sin—and receive the transforming grace God wishes to give them for a life of joy and bliss for all of eternity. This is most effectively taught within the Church, but can also be done out in the community, when taught by a kind, loving, knowledgeable people. You can download free information about reconciliation, or purchase our brochures, posters, signs, etc. to use in educating the people, and bring an explosion of information into their hands. Big changes will come about by doing big things. Big prayer, big sacrifice and big action = big change. Do all that you can, but watch out because Satan will try to do all he can to distract you. Let nothing stop you from saving the souls that Satan so desires to keep for all of eternity. If money is a problem, we will donate the products to you for free—simply contact us online. – Last, but certainly not least, The Pope has requested that some changes need to be made in regards to reconciliation, to ensure every person who has the desire to receive absolution can easily do so. Along with educating the people about the importance of the sacrament, confession needs to be made convenient for the people. Satan sees the fear in the person who hasn’t frequented confession, and he is looking to provide that person with any excuse he can so they don’t go to confession. That’s why confessions need to be heard on the days and times when it’s convenient for the people, with as few deterrents as possible. Read all of Pope John Paul’s Reconciliation Revitalization Program. Just one distraction can mean the difference between life and death for a soul. Confession is the sole ordinary means through which the faithful, with grave sin, can be reconciled with God and the Church. It’s the only ordinary source of salvation for those with mortal sin. (Can. 960) Knowing this reality, what can be of greater importance? Priests are obliged, with the joyful heart of the Good Shepherd, to ensure that confessions are heard when they are asked or even go out to the people to bring them back into the fold. One turn-off can completely deter someone away from the sacrament. Confession is to be made convenient for the parishioners. Assuming everyone can go to confession on Saturday, when many people work on Saturday, is eliminating the possibility for many of the faithful to receive forgiveness especially for those who are too embarrassed or afraid to ask for an appointment. Priest must educate the people about the necessity and blessings from confession and consequences of its omition. Many people aren’t aware of the necessity of reconciliation, and they probably won’t learn it unless it’s passed down to them through the Church (through the priest’s homilies or advertising/educating). Churches should periodically look for ways to improve the confession schedule, style and settings to make it convenient and comfortable for all the faithful to confess their sins giving them the guidance they need to make resolutions to sin no more. “Look for ways to advertise and educate parishioners about confession while improving the sacrament’s schedule to make it more convenient for the people and the way in which priests help guide the penitent away from sin, will reduce the bombarding distractions from Satan in their lives. Confessors should be visibly present during advertised times, and adapt the times and days to real circumstances of the penitents. Many people feel uncomfortable with confession as it is and having to work hard to find a priest to hear their confession is just the distraction Satan will use to keep the penitent from being reconciled with God. 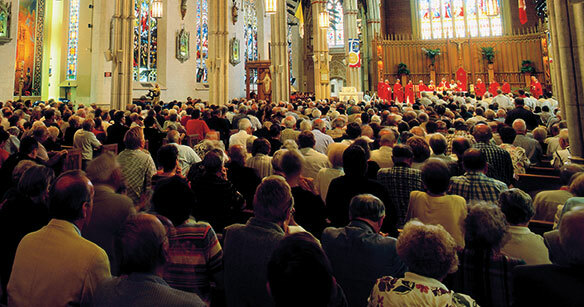 “Confession should be especially available before Masses, and even during Mass if there are other priests available, in order to meet the needs of the faithful” – St. Pope John Paul II (to ensure that souls are purified before receiving the Eucharist) since confession is the only means of salvation for those dead in their sins. Since Satan is looking for any means to prevent God’s children from becoming reconciled, the most convenient means needs to be made available. Nothing should be done to restrict confession to a generic confession of sins especially of mortal sins. Confession isn’t simply listing sins, it is allowing the confessor to understand the sins so correct words of guidance can be given to help the penitent avoid their sins in the future. The penitent should perform a careful examination of conscience. Without a proper examination of conscience, which most don’t know how to perform, the penitent won’t know the sins they are needing to rid in their life. Don’t prevent the penitent from confessing all of his sins especially “grave sins” since the confession of the kind and number is necessary for absolution. Since some penitents have many sins to confess, ample time and a patient confessor are necessary in order for these penitents to receive proper guidance away from their sins. Since everyone is called to holiness, it is recommended that penitents also confess venial sins. There are tremendous graces that envelop a soul that desires to grow in holiness through the sacrament of reconciliation, through confessing their venial sins, which is something that should be promoted. The pope saw much value in the words spoken from the priest and the humbling experience of personal confession, he declared it necessary to abolish “group penitent” services. If a church experiences a large influx of penitents and there happens to be a shortage of priests, rather than resorting to absolution in a group, the Church needs to schedule additional confession times to see that the faithful will not be deprived of this life-saving sacrament in proper form. If there appears to be an extraordinary circumstance and a general confession seems necessary, such a decision is only to be determined by the Bishop. If it was necessary for absolution to be given to many at one time, the penitent must understand the following: serious sins still need to be confessed individually; all penitents should make an act of contrition and choosing to live in a habitual state of sin invalidates absolution. Encourage reconciliation since it is essential to the life of the church; this sacrament will help the faithful draw from the fountain of divine mercy which flows unceasingly from the sacrament of reconciliation. Since this decree is so vital to the unity of the Body of Christ, everyone, especially the leaders of the Church, should see to is that these changes and improvements are implemented. The obligation to confess grave sins at least annually remains. Since the basic requirement for salvation is to repent from mortal sin, the church has left the most basic requirement to be saved intact. The best place to hear sacramental confessions is a church or an oratory, though other places are justifiable. Confession should be made comfortable for all penitents and for the faithful that wish privacy or a face to face experience, both environments should be available. Only offering one means of hearing confessions is another deterrent Satan uses to frighten and convince the penitent they can’t go to confession. We need to ensure there are few distractions so as many people as possible can be reconciled.